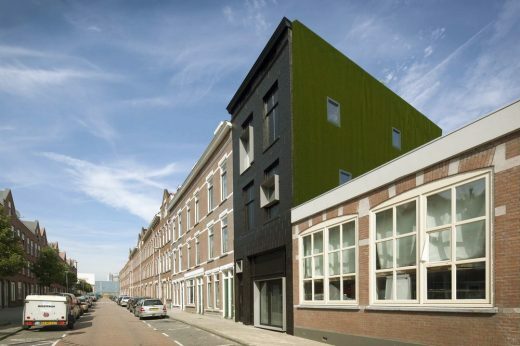 This house takes part of a program of the congregation Rotterdam who wanted to revitalize disadvantaged neighbourhoods by selling metier houses to private persons. These homes have in common that they are neglected the last few years and have to be refreshed. The buildings usually consist of several small apartments, one per layer. The purpose of the municipality by selling the buildings is to attract inhabitants with more carrying-capacity. Condition of sale is that the property will be restored within a specified period and will transformed into one house. This causes less, but larger houses. This is the opposite trend to what happens in many inner cities where larger houses are divided into several small apartments. 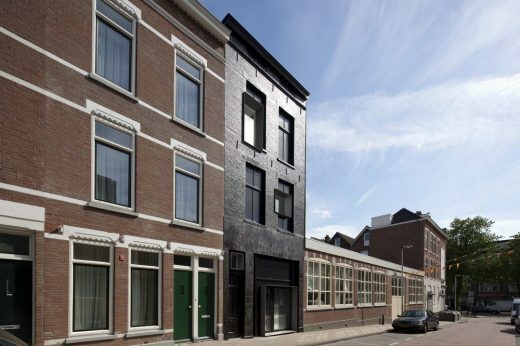 The renovation of the Rotterdam ‘metier house’ is turned into an architectural spectacle, where was experimented with time and space. 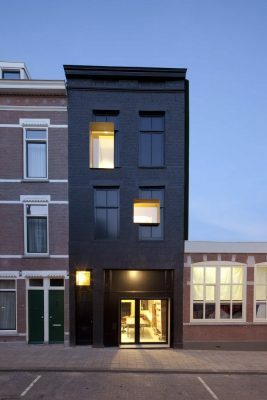 The 100 years old facade of a dwelling in a closed housing unit, is totally painted black. Both masonry, frames and “windows” are covered with a shiny black oil. 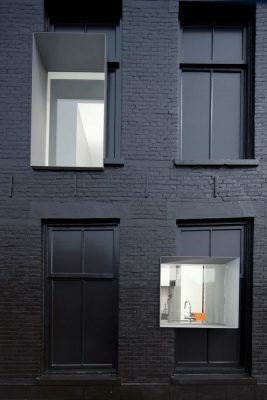 This creates a kind of ‘shadow’ of the original facade. 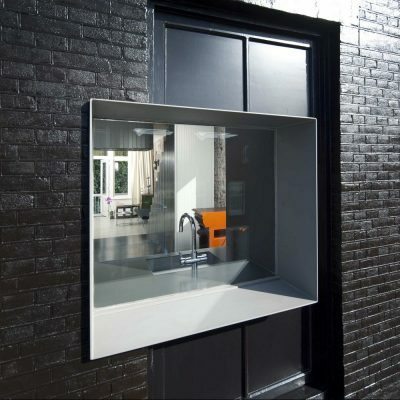 In some places the new transparent windows pierce through the historical facade. The new windows announce a time with a very different way of living. 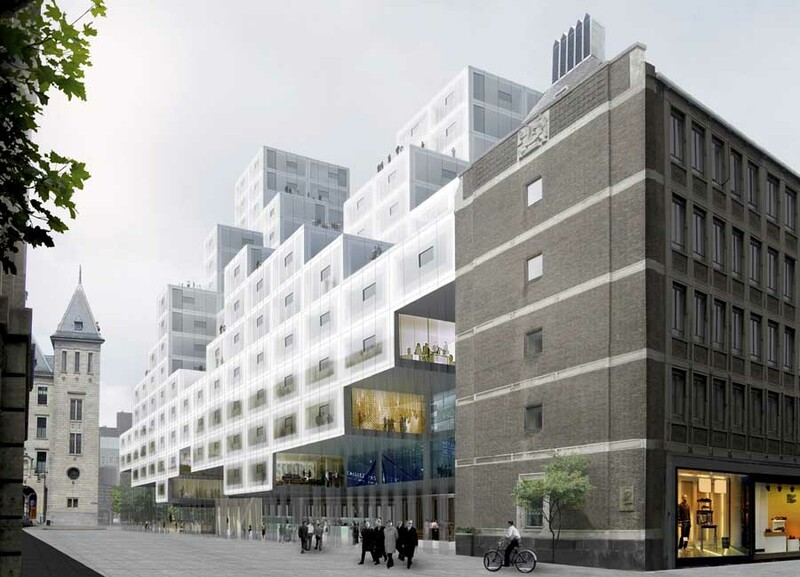 This creates a relationship between the original facade and the new interpretation which become readable. All floors and small rooms behind the old windows run into one spatially contiguous entity. Just like in the façade, also in the interior the traces of the past remained visible. On the building walls an old banister and holes of removed floor joists reveal the original layout of the dwelling. The new house in the 100 year old cover has a completely different planning. The traditional layout of floors and walls, which compose the rooms are missing. Instead a series of small wooden slats compose a huge sculptural element. 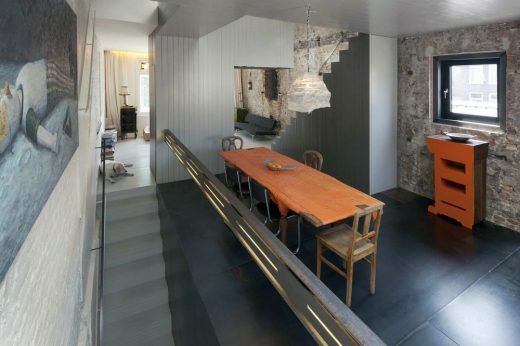 By this is a continuous space is left between the four walls of the historic building. 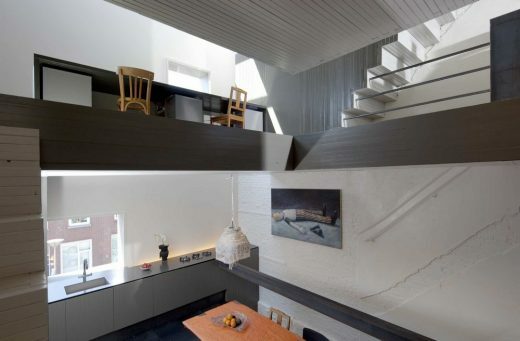 This creates living spaces, which are connected by voids, large stairwells and long sightlines. 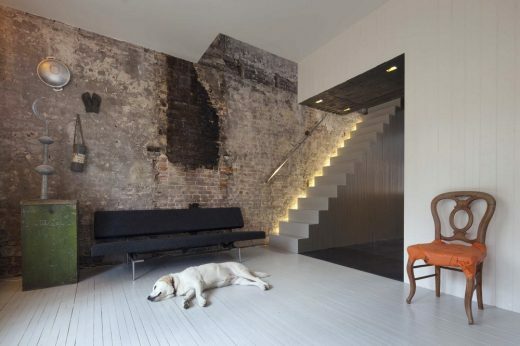 All redundant banisters, railings and doors are left out, causing a high degree of spatial abstraction. 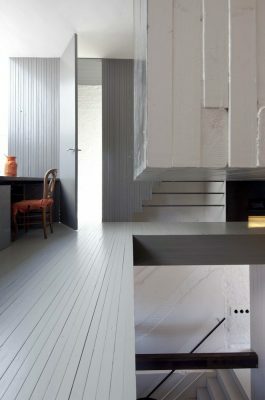 Floors, walls, stairs and ceilings blend together and seem to recall an “Escher-like” impossibility. Yet this metier house (that has been empty for nearly 30 years) is far from uninhabitable. In the lower part of the house a large workroom is placed connected to the ‘roof tiles-bamboo garden’. Above is a series of semi-open living functions: living, eating, cooking, study, sleeping and a bathroom / closet. The old roof tiles are removed in the upper part (re-used in the garden) and a new greenhouse is placed with a hot tub with a stunning view. New interpretation: three worlds The existing building is used as a box to build a completely new house in it. All walls and floors of the house were demolished which created a space of 5 meters wide, 10 meters long and 11 meters high. 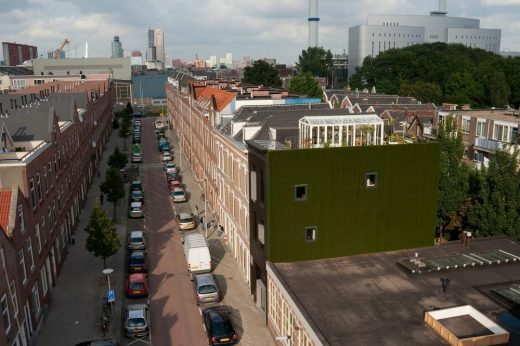 In and up this box three different “worlds” are stacked: the studio, the house and the roof garden. On the ground floor, the 5 meters high studio is built. 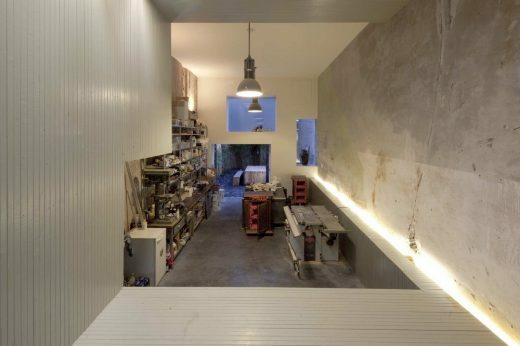 This studio space is kept as open as possible. This is achieved by organizing the necessary facilities along the walls as much as possible, in one continuous element. 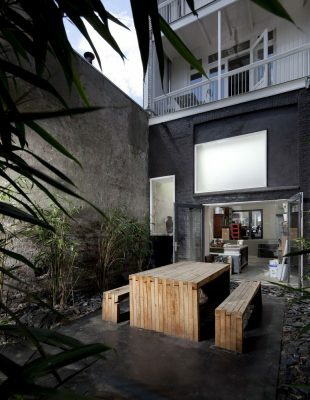 The living area is placed above the studio with a height of 6 meters. In this space, a sculpture is build which divides space into several areas without creating closed rooms. The object is designed and situated in a way that in several places views arise which emphasize the entire length, width and height of the place. 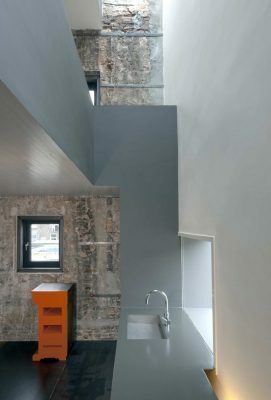 The design is concentrated on the residual spaces between the object and the existing walls. Materialization sculpture The sculpture is entirely composed of screwed bars together which forms both construction and finish. 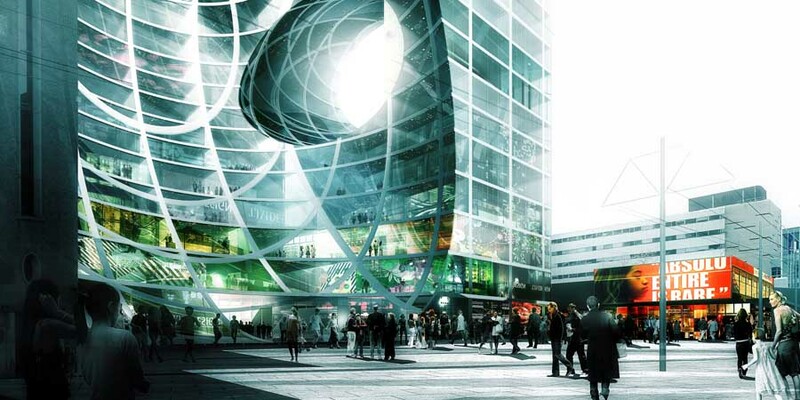 This construction method creates a great freedom of form. A large part of the object hangs with these bars on the roof floor so that support becomes superfluous. 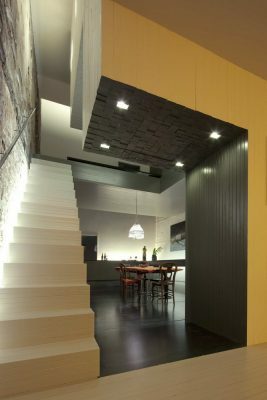 Colour use In the house, five colours are used: black, white and three greyscales. An existing side wall is totally painted white. The traces of construction, including the old railings and pipes are all painted white. The other building wall is left untreated. The different faces of the object are painted in three greyscales. These shades are aligned to the space they enclose. By this method, the space between the object and the existing box are strengthened.